The curious range of pink sapphire rings here at Diamond Boutique are crafted from a naturally-occurring gemstone that gets its pinkness from the chromium in which it was formed. Mined predominantly in Madagascar, the pink sapphire is a popular gemstone for engagement and wedding rings. Radiating a romance that is perfect for celebrations of love, the designs offered are as unique as they are beautiful. 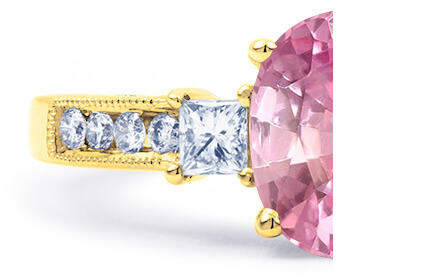 Find your perfect pink sapphire ring in our collection today. Many of the unique designs offer free engraving; contact us today on +44 (0) 203 6959 885 if you need any help or have a special request.